Why is it that many of today's scanners and digital cameras continue to be supplied with only rudimentary applications through which the poor operator is expected to perform miracles. Surely having spent many hundreds of £/$ on this hardware we deserve better? Well this user decided a long time back that miracles were not within my gift and so began the search for alternative scanner software that would provide me with the the tools I needed. It didn't take long for me to find what I was looking for - LaserSoft Imaging SilverFast Ai. That was late 1999 and I've been using SilverFast with a wide range of scanner types and models ever since. In the intervening years LaserSoft have continued to develop SilverFast by implementing new features and tools; most of which are as a direct result of user feedback. With each new iteration I find myself wondering what next? Okay we've reached a new milestone and with it we find that LaserSoft has set an even higher standard for ease of use and control of our desktop-scanners and digital cameras. SilverFast is now available for more than 120 scanners and digital cameras. It is designed to operate under Mac OS9.x and OS-X, Windows 95, 98, 2000, and Windows NT and XP. Note: underlined text depicts a Hotlink to a page containing screenshots and more details on a function or tool. I adopted this approach to minimise download time and keep the main review text to one page. I hope that you don't find it too awkward or confusing. Chief among SilverFast attributes is the intuitive user interface with sophisticated and powerful controls. Novices and professionals are equally well catered for and each will appreciate the ability to edit images in real-time. The user definable controls ensure that the intelligent automatic tools provide near perfect colour and tone corrections with nothing more than a simple button click . For ultimate image quality it is possible to manually adjust the image at any point by accessing the the appropriate tools from the Adjustment Tools Palette. The following screenshot shows the SilverFast's Adjustment Tools palette and by clicking the following hyperlinks: Levels Histogram, Gradation Curves, Colour Balance you can read about the tool. You can also see a larger preview of the actual tool and its associated control panel. SilverFast is designed to operate using the full bit-depth of the scanner or digital camera and can output edited images as either 24bit or 48bit colour and 8bit or16bit greyscale. All versions of SilverFast allow the user apply various Filters to their images. 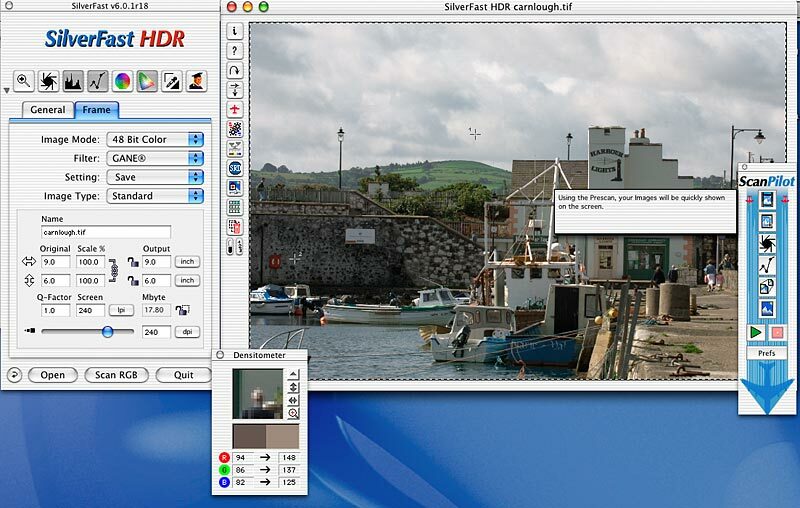 The following screenshot shows the selection available within SilverFast HDR. In their Press Release for SilverFast 6 LaserSoft Imaging identified "10 new unique highlights". I'm not sure that all 10 are in fact new, but let's not be pedantic. Although not new in itself Selective Colour Correction has nevertheless undergone a major revamp and with it LaserSoft has introduced a few new mini-features. Selective Colour Correction can now operate on up to four layers with each layer having its own independent colour correction. The real beauty of this new feature is that 4 objects comprising the same initial RGB value (same colour) can now be treated as different colours. This enables you to achieve complex colour corrections very easily. With a special function (Mask Edge Size found under the Options dialog) we can also control the amount of edge fading for the selection mask (feathering). SRD or Smart Removal of Defects is most definitely new. It's LaserSoft's answer to Applied Science Fiction's Digital "ICE" function as found on more recent Nikon scanners (Note: true ICE dust and scratch removal is also available as standard with the Nikon version of SilverFast Ai). The main difference between ICE and SRD is that the latter operates completely within software and requires no special hardware functions to be implemented within the scanner itself. The means that SRD is independent of any particular scanner type or vendor. Dust and scratches are automatically recognized by SRD which highlights the artifacts in red. Using the interactive controls we can adjust the number and size of artifacts that will be picked up. The facility to select whether SRD will operate on white, black or all artifacts is a particularly useful feature. SRD operates in real-time and quickly finds the best possible combination of settings. If SRD picks up on image details and attempts to treat them as dust or scratches we can easily exclude these details using the exclude-mask function. Difficult scratches that cannot be removed using the normal settings can be handled in another layer or via the Expert mode. Selective Colour to Grey or SC2G is another new feature and one that will please many. Typically some colours that are normally very easy to distinguish from others will after conversion to grey appear virtually identical. Many photographers will recognise this problem. Clearly this is less than desirable especially when we find it means spending even more time and effort trying to separate out these shades of grey. With SC2G we can directly control the way both the primary and secondary colours within the image convert into shades of grey. SC2R is a very powerful tool and one that requires some time and effort to fully understand and appreciate. However, once you've got to grips with SC2R you will probably never want to look at another B&W film, instead opting to shoot only colour positives and then do the conversions to grey on the computer. Grain and Noise Elimination or GANE is the LaserSoft equivalent of the Applied Science Fiction's Digital ICE "GEM" tool as used on Nikon scanners. Film grain is present on most photographic emulsions and we find that the higher the film speed, the larger the grain size. Unfortunately, we also find that many of the new breed of high resolution film scanners are prone to exaggerating grain; sometimes to the extent that the quality of an image is significantly reduced. The term Grain Aliasing has been used to describe this property, but giving it a name does little to reduce its effects. As the name suggests GANE has the property of reducing the apparent graininess of film scans, especially negative type film. It also helps reduce the effects of noise in images captured on low-end digital cameras. The downside of tools such as GANE is that the resulting image tends to be slightly soft. LaserSoft continues to work on GANE and it's hoped that a future version will include the Unsharp Mask option for restoring lost sharpness. In the meantime we can use Photoshop's own Unsharp Mask filter. ACR or as LaserSoft call it Adaptive Colour Restoration resides within the Selective Colour Correction dialog and is closely related to it. I'm sure that you will have noticed that film and print media tends to fade over time often resulting in odd colour casts. Adaptive Colour Restoration was developed by LaserSoft to help reduce the worst effects of this ageing process. ACR will quickly and without too much fuss restore faded colours. It works really well with old faded negatives and breaths new live into images that would otherwise be fit for the trashcan. ACR can be used along with the other tools in the Selective Colour Correction dialog so that after automatic correction we can fine tune specific colours that may have been over/under corrected. If the above description appears familiar to you - it should. ACR is broadly similar to Digital ICE "ROC" as used on Nikon scanners. The SilverFast Application module was first introduced with SilverFast version 5.5 for Mac OS X. At the time neither Photoshop nor any other image editing program had been ported to OS X and so those who had adopted OSX found themselves with no means of editing images. Obviously SF_App was a success and now we find it has been made available for all platforms and Operating Systems. Using SF_App SilverFast can be operated as a Stand-Alone application. This means that if you don't have Photoshop you can still use SilverFast 6. A further advantage of the SF_App is the small memory footprint of around 2 to 4 MB. With such a low memory overhead SF_App and therefore SilverFast is significantly faster at loading. This is particularly useful when using a laptop computer with a small amount of memory. 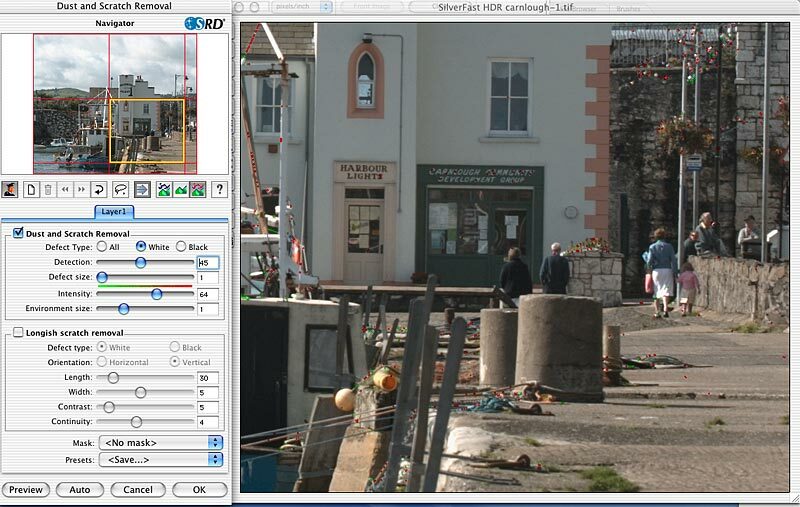 Using the MidPip4 feature colour casts resulting from mixed light conditions can now be eliminated. In fact until LaserSoft provide a better means of correcting white balance in digital camera images MidPip4 can be used to provide a very effective workaround. Up to four neutral points can be set, and by means of a special dialog neutral density values can be edited. Whilst this feature doesn't appear to offer anything special it actually turns out to be a very powerful tool. Fine tuning is achieved by double-clicking onto the tool and this brings up an Expert-dialog with edit fields showing the “before and after” RGB or CMY values. These values can then be changed as desired (e.g. values slightly off neutral can be set). This way very subtle cast corrections can be achieved. IT8 calibration - Version 6.1 and higher include IT8 calibration as standard with all Film scanners and DCPro. IT8 calibration allows the user to generate ICC colour profiles for any film scanner or digital camera supported by SilverFast. Using this feature, you can calibrate your scanner using a standard colour target which LaserSoft Imaging supplies to you. SilverFast will not only generate a profile, it will also generate its own internal calibration based on the target. The LaserSoft IT8 module now operates in much the same way as other 3rd party profile building applications and since LaserSoft also supply their own high quality IT8 targets users will. have little need to purchase 3rd party alternatives. Furthermore, LaserSoft targets are unique in that they include a bar code that is used by SilverFast to automatically detect the correct reference file thus further simplifying the process of creating ICC profiles. QuickTime Movies - so far as I am aware SilverFast is the first imaging software to supply QuickTime movies as online training. The user can instantly understand and know how to operate the function exemplified by the movie. 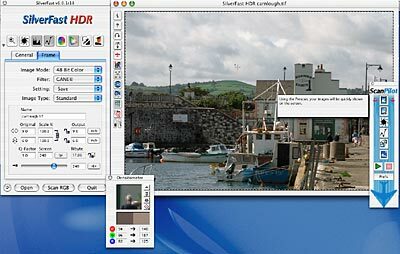 SilverFast DCPro is a special version of SilverFast designed for high-end Digital Cameras. It is intended to address the needs of digital photographers who prefer to capture images using what is know as the RAW image format. DCPro combines the functionality of SilverFast Ai with the Virtual Light Table (VLT) feature discussed below. The application also provides important image correction tools, such as red-eye removal, colour correction, white balance, and exposure adjustment. Advanced SilverFast features, including ACR, USM, GANE, selective colour correction enable users to get the most from their digital images. DCPro is compatible with a wide range of digital camera models including those from Canon, Nikon, Fuji, Minolta, Kodak, Olympus, etc. 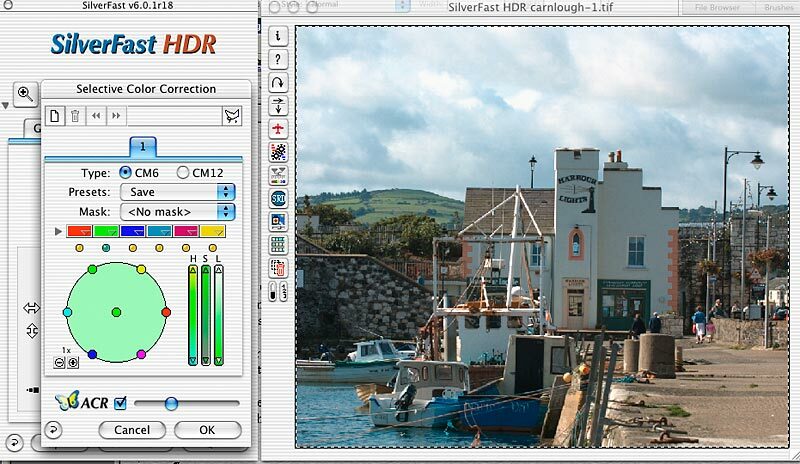 The latest versions of SilverFast HDR, DCPro and DC utilise the new Virtual Light Table (VLT). Whilst VLT has undergone considerable improvement over recent months I'm still not convinced of the workflow. 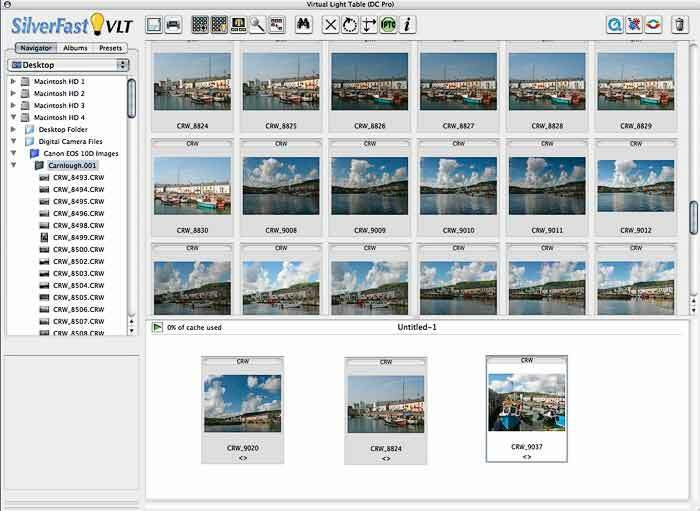 VLT is intended to provide an efficient way to organise images for processing. Images in different file directories can be viewed in an adjustable overview window using variable-sized thumbnails. The user can then choose to drag images into a user-defined Album section. Images can be viewed using the magnifier located on the VLT. At any time, images from the Album can be corrected individually in the SilverFast Preview or batch processed in the SilverFast Job Manager .VLT also incorporates image management features including: thumbnail sorting, file searching, EXIF preview, and comment annotation. New printing features in VLT permit printing of contact sheets as well as full-screen high-resolution preview images are now possible. The above screenshots show the 3 different ways in which the histogram can be displayed when the image is in RGB colour mode (default). However, SilverFast also allows the user to edit images using the CMYK colour mode and a similar set of histograms, albeit reversed and coloured CMYK rather RGB. The Colour Cast Removal tool is particularly useful for removing casts in both highlights and shadows whilst having virtually no impact on the midtones. Like many of SilverFast's tools it operates in real-time and so the user will quickly see the effect of dragging the slider to the left or right. The Histogram is probably the most used tool within SilverFast yet much of it remains a mystery to the user. The following tutorial should help explain how this tool is best applied - Basic Image Editing - Levels Histogram. The Gradation Curves tool is very powerful and allows the user to adjust the Gradation (midtones), Contrast, Shadow and Highlight points, and overall Brightness. It is also possible to manually reshape the curve to reflect specific image requirements (e.g. S-curves). The user can define the shape of the curve using either the slider or via numerical input. We can also decide whether midtone gradation adjustment is based upon a Normal (N) or Logarithmic (L) scale. Typically images that show darker than average 3/4 tones will benefit from the use of the L midtone gradation adjustment. The Global Colour Correction tool allows us to reduce colour casts that effect the overall image (e.g. whole image appears too yellow - increase blue). However, it is assumed (and always a good idea) that the highlight and shadow points have already been neutralised using either the Histogram tool or Highlight/Shadow pipettes. The zone bounded by the blue line (see the right hand screen shot) is where we can configure increment by which the correction will applied. It has 3 settings: Coarse, Medium (default) and Fine. I find dragging the "spot" around the colour wheel to be much more effective than using the sliders. The zone bounded by the red line is where we define whether the colour correction is applied to the full-scale of the image, Shadows, Midtones or Highlights. To make the colour adjustment we can use either the sliders, the "spot" (LaserSoft call it the Hand) within the colour wheel or click the coloured dots that surround the colour wheel. Any adjustments made will also be reflected in the Gradation Curves dialog as shown below. Selective Colour Correction has been significantly improved in SilverFast 6 with the addition of Layers (up to 4) and Adaptive Colour Correction. We can make selection within our image and so restrict the colour correction to a specific area or we can apply the correction to our selected colour across all areas of the image. The two screenshots shown above depict typical situations. The first (left) shows that I've selected RED and have dragged increased its value (strengthen). The second screenshot demonstrates an alternative method of applying a similar edit to greens. The Selective Colour Correction tool is very powerful allowing very intricate colour edits to be made on the image. It's beyond the scope of this review to discuss in detail how SRD operates, however, I've included the above screenshot to show the extent of the toolset provided. I'm not normally a great fan of this type of tool, finding that whilst they fix one problem it's usually at the expense of overall image quality. That said and with care SRD does a reasonable albeit slow job of cleaning up most dust and scratches. I particularly like the ability to create selection masks using the built-in Lasso and Brush tools. Layers are also supported (up to 4). For long scratches and/or fibres we can activate the Longish scratch removal function. However, I should warn that using this function can further increase overall processing time. The above B&W image shows what can happen when we simply convert form colour to greyscale. The rear of the boats and the stone wall shown left of frame are on the dark side even though each was well separated from adjacent elements in the original colour image. Can it be fixed? Notice that the rear of the right most boat is a lot brighter as is the shop front and stone wall. There are other areas of this image were the correction is much more subtle. However, I think you will agree that the final result is a lot better than the original conversion. Removing grain and/or noise form the image is relatively straight forward with GANE. First we prescan a close-up section of the image at high resolution and then either choose one of the 3 default settings or manually adjust the parameters to suit our own preferences. 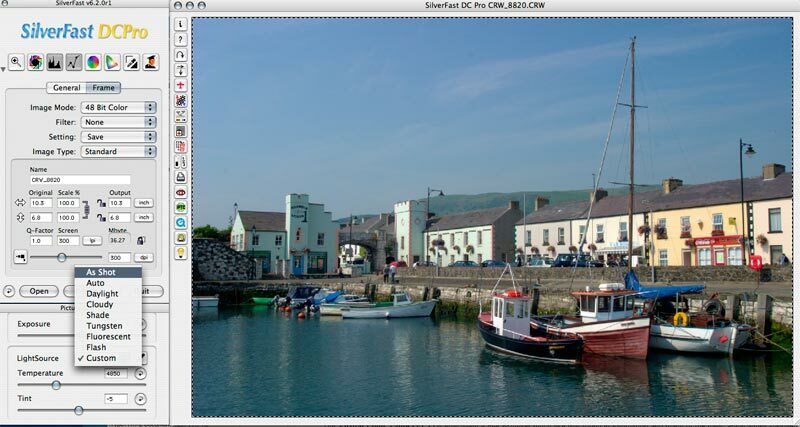 The before and after preview window enables accurate assessment of the image. 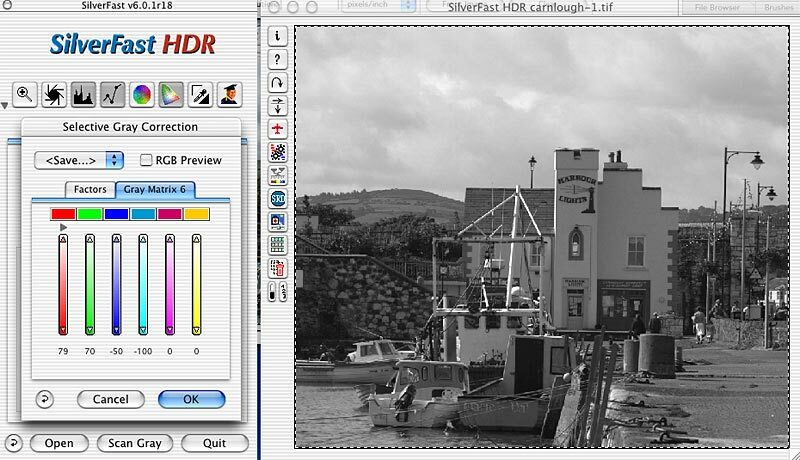 By activating the ACR checkbox in the Selective Colour Correction dialog SilverFast ACR will immediately analyse the image and apply a correction. Typically this will result in a degree of saturation increase/decrease that is greater than required. The above image shows what can happen when ACR is left to its own devices. 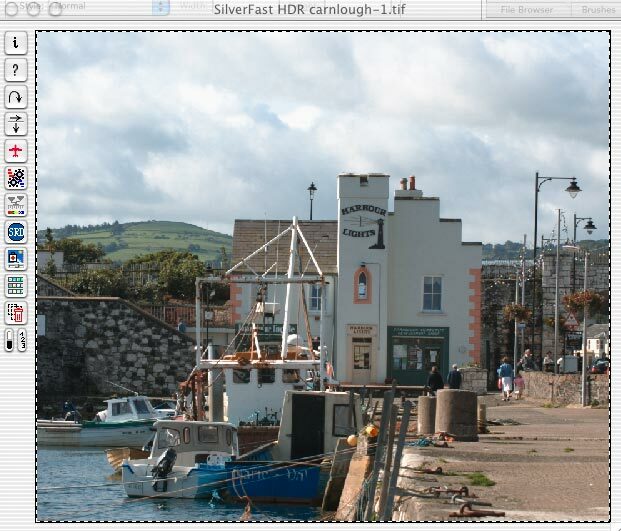 However, moving the ACR slider slightly to the left will reduce saturation to a more acceptable level. 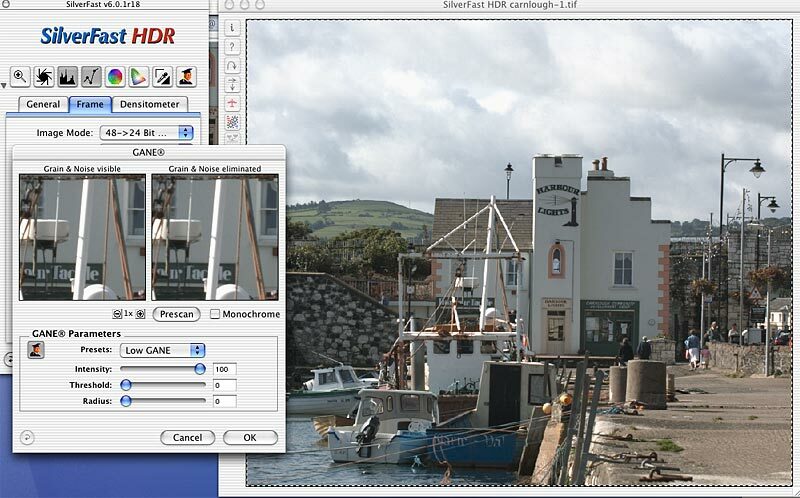 Using the ACR slider I reduced saturation slightly and obtained the image shown below. With a little more effort I could easily reduce saturation further without sacrificing the overall effect. In developing DCPro LaserSoft have continued with their tried and tested application interface. Whilst this interface may not match with the expectations of those who believe that the Microsoft way is the only way it does serve its purpose. It's also worth noting that because SilverFast is fundamentally a Photoshop plug-in there are constraints placed upon certain aspects of the interface. Apart from the additional controls for adjusting image Exposure and White Balance plus the special function buttons for: Red Eye correction, IPTC data editing, high resolution full screen preview, and printing there is little to differentiate DCPro from the scanner version. The Exposure/White Balance controls (Picture Settings) were first introduced to SilverFast HDR in the early part of 2003 and initially I was quite happy with their operation. However, digicam images are not the same as those from a scanner and it quickly became apparent that the White Balance control being limited to slider operation meant that targeting a specific area of the image as the source for White Balance wasn't possible. LaserSoft recognised this limitation and have completely rewritten the tool with the additional of Tint and Eye-dropper tools. We also have menu options for all the usual WB settings including: As Shot, Flash, Tungsten, Daylight, etc. The Virtual Light Table (VLT) is a File Browser much like that found in Photoshop and many of the basic applications supplied with digital cameras. Although LaserSoft have adapted the File Browser concept slightly to match their perception of the photographers post-capture workflow. A number of Preset configurations are also available. To open an image for further editing within the main SilverFast application you drag the its thumbnail to the Album area and either double-click the thumbnail or click on the little green triangle. Conversion time is dependent upon processor speed, but I've found that on my Mac OS X system DCPro converts Canon D30/60 and 10D images noticeably quicker than Canons own application. As is the case with SilverFast Ai and HDR we find that batch processing of images is easily handled using the Job Manager Function. Actually Job Manager is probably the most effective and flexible batch processing tool of any that I'm currently aware of. The pity is that it isn't obvious to the new user what it is and how it works. Is that all there is to SilverFast 6? Hmm, I haven't mentioned NegaFix or Job Manager both of which were originally added as part of the 5.5 update. Nevertheless, both are extremely useful and important functions. More details of each can be found in my NegaFix and Job Manager tutorials. I haven't mentioned ScanPilot or the Expert function nor have I mentioned Permanent Softproof for CMYK, Plug&Play CMYK, Real-Time Exposure control in histogram (Agfa, Microtek, Polaroid, Nikon) Grey ICC-profiles support, EasyEdit, Balloon Help for Mac OS-X and WIN XP, Auto-Registration, Auto-Update check from within SilverFast and a host of other functions and features that are too numerous to mention. Are there any downsides to SilverFast 6? - Yes! - SRD and GANE require a powerful computer with plenty of memory otherwise image processing can take somewhat longer than most will find bearable. Nikon users will be happy to learn that LaserSoft now offer full support for ICE. Nearly a year after LaserSoft first introduced version 6 they have expanded the range to include a version compatible with a wide range of digital cameras. Since its release I've received many emails asking why I have not reviewed DCPro and whether I use it. Yes I use it, but not exclusively. Furthermore, I don't think a separate review is necessary since DCPro is effectively SilverFast HDR with a raw image converter module built in and my thoughts on SilverFast Ai/HDR are widely known. However, the original version of DCPro presented me with a number of difficulties not least of which was the very poor white balance control and the Virtual Light Table (VLT). With version 6.02rx now publicly available I'm happy to say that the new white balance controls are a significant improvement on the first attempt. I still find VLT to be cumbersome in use, but at least the user now has the ability to delay image conversion until they are happy that all the images have been selected. The minor but annoying aliasing artefacts present in the converted images are now gone and conversion is much quicker. LaserSoft will no doubt make further workflow improvements to DCPro and very likely these will also be incorporated into SilverFast Ai and HDR. Whilst many of the issues that I and other reviewers had identified were more annoying than show stoppers LaserSoft clearly took some of them to heart and made the necessary changes. Whether these changes will be enough is another thing. From my own perspective I still think there is more work to be done, but I'm also left wondering as to whether there's any real point especially now that Camera Raw is and integral component of Photoshop. That said I don't for a moment believe that DCPro is a lost cause rather that with a bit of thought it actually presents LaserSoft with another opportunity. What do I mean? Other than RAW image conversion DCPro and HDR are essentially the same product and share a large amount of functionality; i.e. processing of images captured at an earlier time. The "light table" concept (VLT) is common to both whether we are viewing a large number of raw scans or digital RAW files. Likewise the range of colour and tone editing tools. So why do we have two separate products? Both these products should be rolled into one and marketed as such. So far as where the work needs to be done, well that's pretty obvious - VLT needs to become a lot more intuitive. More details on SilverFast 6 Ai, HDR and DCPro can be obtained from the LaserSoft Imaging web site. There are also fully functional demo versions of SilverFast available for download along with a number of tutorials.